LAS VEGAS (March 27, 2017) – After two years and four sold-out performances, Latin music phenomenon Enrique Iglesias will return to The Colosseum at Caesars Palace for his third consecutive year celebrating Mexican Independence Day weekend in Las Vegas. Performances are scheduled for Friday, Sept. 15 and Saturday, Sept. 16. Tickets will go on-sale Friday, March 31 at noon PT. The shows are presented jointly by AEG Presents and Caesars Entertainment. LAS VEGAS (March 9, 2017) — Forbes Travel Guide recently unveiled its annual Star Ratings, naming Restaurant Guy Savoy and The Laurel Collection by Caesars Palace as part of this prestigious list. The renowned Restaurant Guy Savoy earned Five Stars and the world-class destination resort received Four Stars. Additionally, The Cromwell, the only standalone boutique hotel on the Las Vegas Strip, earned a Recommended Award. Each will be showcased alongside all of the Star Rating recipients on ForbesTravelGuide.com. 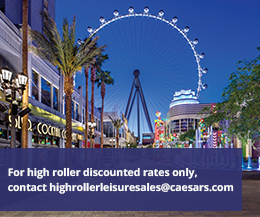 LAS VEGAS (Nov. 29, 2016) – Caesars Entertainment Corporation (NASDAQ: CZR) today announced that it will launch a paid valet and self-parking initiative intended to improve the parking experience for guests, local residents and Total Rewards loyalty program members at eight of its nine Las Vegas properties. The Rio All-Suite Hotel & Casino will not be included in this program and implementation dates will vary by location. LAS VEGAS (Nov. 15, 2016) – With 20 unique chapels and venues in the “Wedding Capital of the World,” Caesars Entertainment Las Vegas resorts offer all-inclusive experiences and special packages for the 2017 wedding season, such as poolside ceremonies, in-suite receptions, live webcasting options and free monthly cake tastings open to the public. 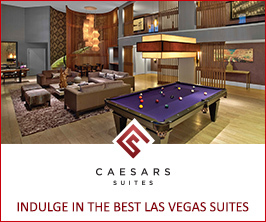 LAS VEGAS, NV (Nov. 7, 2016) – Caesars Entertainment Las Vegas Resorts receive more than 60 “Best of Las Vegas” Awards voted on by the readers of the Las Vegas Review-Journal. The local Las Vegas newspaper announced the 2016 winners of the annual poll on Sunday, November 6. Las Vegas (Oct. 24, 2016) – Due to an overwhelming demand for tickets to “Backstreet Boys: Larger Than Life” at The AXIS at Planet Hollywood Resort & Casino, eight additional shows in April 2017 have been announced and will go on sale earlier than expected. Fans will have another opportunity to get the best seats to see Backstreet Boys’ headlining residency, as only a limited number of tickets are still available for the previously-announced shows. LAS VEGAS (Oct. 9, 2016) – Last night, Céline Dion shared a momentous milestone with an enthusiastic, sold-out crowd as she took the stage of The Colosseum at Caesars Palace for the 1,000th time. The milestone performance opened with an emotional video that highlighted memorable moments over the almost 14 years that Céline has performed in The Colosseum and closed with a breathtaking finale of bronze and silver confetti and balloons raining down on the stage and crowd in celebration. All 4,298 guests that attended the special, sold-out performance received a commemorate program book and lenticular credential as a gift to memorialize the milestone. LAS VEGAS (Sept. 28, 2016) – Located at the center of the Las Vegas Strip, Harrah’s Las Vegas offers guests an unforgettable experience without having to spend a fortune. Touting the newest renovated hotel tower on The Strip, guests have the option to retreat to one of 600 standard guest rooms and 72 suites. Las Vegas (Sept. 23, 2016) – Confirming rumors swirling for months, the best-selling boy band of all time, with over 130 million albums sold worldwide, is heading to the Las Vegas Strip. This afternoon, the pop juggernaut Backstreet Boys announced they will begin an exclusive Las Vegas headlining residency show, “Backstreet Boys: Larger Than Life,” inside The AXIS at Planet Hollywood Resort & Casino beginning Wednesday, March 1, 2017. In honor of its 50-year legacy at the center of the Las Vegas Strip, the iconic Caesars Palace celebrated its golden anniversary with an opulent birthday pool party, featuring a five-tier cake, champagne toast and a 10 minute fireworks extravaganza hosted by award-winning chef Gordon Ramsay. Gordon Ramsay to Host Celebratory Pool Party, Champagne Toast and Fireworks Extravaganza – Friday, Aug. 5. Tony Bennett, Howie Mandel, Wayne Newton, Donny & Marie Osmond and The Righteous Brothers to Headline Anniversary Gala – Saturday, Aug. 6. Following the release of her hit new single with Lin-Manuel Miranda, “Love Make The World Go Round,” Jennifer Lopez has announced 21 additional performances for her record-breaking headlining residency, “JENNIFER LOPEZ: ALL I HAVE” at The AXIS at Planet Hollywood Resort & Casino. The new dates go on sale to the public beginning Friday, July 22 at 10 a.m. PT.